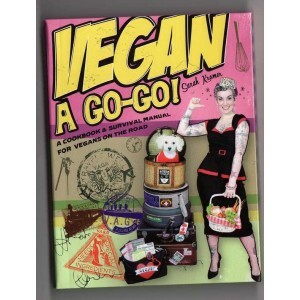 The World's Coolest Vegan (Herbivore Magazine) introduces her fourth book for vegans: a cookbook and more for vegan travellers, many of whom are daunted by the idea of going on the road and being able to locate and prepare the kind of nutritious, yummy meals they enjoy at home. The new, full-colour book includes 150 recipes which are easy to prepare and contain a minimum of ingredients. The rest of the book contains info and advice pertinent to vegan travellers, from how to decode a restaurant menu to foods readers can keep in their luggage.